FILE - Russian lawyer and blogger Alexei Navalny attends a rally in Moscow, Oct. 22, 2011. Alexei Navalny, the well-known Russian opposition activist and founder of the Anti-Corruption Foundation, filed a lawsuit against Vladimir Putin in Moscow's Tverskoy District Court on Thursday. Navalny detailed his case against the Russian president in an exclusive interview with VOA's Russian service. Q: What is the substance of your suit against Vladimir Putin? A: Today we filed an administrative suit against the president of Russia, Vladimir Vladimirovich Putin. This suit is not of a political nature or a general nature. It is a very specific statement regarding the personal, individual actions of Putin, in which we found signs of a conflict of interest. The fact is that Putin has a daughter — her name is Katerina Tikhonova. This daughter has a husband — his name is Kirill Shamalov. And this man owns a large stake in a huge petrochemical company called Sibur. And after Vladimir Putin's son-in-law became a Sibur shareholder, Putin personally ordered that nearly $2 billion be transferred from the National Wealth Fund [Editor’s note: This is Russia's sovereign wealth fund] to Sibur. This conflict of interest is practically a textbook case: Such a situation is plainly spelled out in Russian law. And we filed suit because we are demanding that Putin declare this conflict of interest. Such a situation is legally valid: It cannot be immediately declared to be corruption, but Vladimir Putin is obliged to report this conflict of interest to his immediate superiors. His immediate superiors, under the law, under the constitution, are the people of the Russian Federation. We appealed to the court, and to the presidential administration ... and to the prosecutor's office, which oversees the law. Justice, fairness and basic common sense are on our side here. It seems to us that even those people who are fans of Vladimir Putin cannot deny the fact that it's not very good when a person bequeaths billions to his son-in-law. And if he bequeaths it, then he has to report it, as required by law. FILE - Russian President Vladimir Putin chairs a meeting on counterwork against corruption at the Kremlin in Moscow, Russia, Jan. 26, 2016. 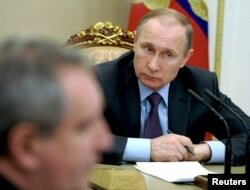 Q: It is known that Vladimir Putin is very wary of any talk about members of his family, as are Kremlin officials. Are you trying, through this suit, to reveal the family side of Putin's life? A: No, that is not our objective. If Vladimir Putin is so delicate and sensitive about the issue of his family, family members, then it is probably not worth involving these family members in a business so large that billions of dollars from the state go into it. The very fact that Katerina Tikhonova is his daughter and Kirill Shamalov is his son-in-law has repeatedly been published by the media. But, if necessary, I am sure we will prove this in the litigation. And, frankly, I don't think Putin will deny that she is his daughter. He probably won't go as far as disowning his own child. One way or another, these facts must be verified. We fully understand that the law is on our side. We don't have any kind of specific task to reveal the structure of his family. But, I repeat, if he wants to hide his relatives, then let us at least remove them from a multi-billion-dollar business. Q: How typical is this situation in modern Russia? Is it an exception to the rule; did you discover something unusual and thus file suit, or is it something commonplace, which you decided to highlight this way? A: I would say that this is not commonplace and not a rule, but is simply the law by which the current Russian government lives, which of course can be classified as feudalism. And it is part of this feudal system that has been built and through which specific places at the "feeding trough" are distributed to the children of the elite, the families of the elite. Shamalov was simply the son of a Putin friend. As soon as he married into Putin's family, part of the Sibur company was handed over to him. ... This is absolutely commonplace. Perhaps this situation stands out because we managed to catch Putin himself in a conflict of interest because he personally signed the document. This is more often done through more clever legal constructions. But the fact remains that if we look at the children from his inner circle, they all are perched in various state banks. They control flows of state money. Q: But perhaps, if the money went into Sibur, its management can say that it is solely for business development, and that Shamalov does not benefit from this money. A: Please — they can say anything. But the legal fact remains that Kirill Shamalov is not an employee of the company Sibur. He is a co-owner, the largest shareholder, and therefore everything that is good for the company Sibur is good for Kirill Shamalov, and makes him richer. And such a situation is directly spelled out in the law "On Combating Corruption." It is straightforwardly called a conflict of interest. We are not saying that Putin moved two billion [dollars] to Sibur and that Shamalov personally collected it. The company took it; he's a shareholder. That's why we are not calling it a case of corruption. We are calling it a conflict of interest. And Putin should openly admit it. Q: What do you expect in terms of a state response to your suit? A: ... It is easier and more correct for [Putin] to disclose this conflict of interest and say, "Well ... yes, the husband of my daughter, a fine young man, works in Sibur. The money was transferred to Sibur because it is an important company that is in crisis [and] we wanted to support it. I am disclosing this." Quite a few questions can still be asked, but at least there is no direct, flagrant violation of the law. Knowing what the presidential administration does as a matter of practice, knowing the behavior of Putin himself, we of course assume that they will do everything possible not just to extricate themselves from this situation, but not to utter a single word in response, not to say either "yes" or "no." They will make it so that the court does not accept our suit, that our complaints get lost along the way. They will simply pass over this question in complete and total silence. Nevertheless, we will press our case.